Back when I was in college (said in old person voice), when the sun rose on Gameday, we would put on our best Mountaineer t-shirt or hoodie and jeans and take the PRT (or walk) to tailgate. Then you have southern football. Girls were cute dresses to the games in their team’s color. So for my ladies out there, if you want to add some girly touches to your gameday attire, here are some fresh suggestions. 1. UGA Apparel – LOVE this line from a WV-based company (I’ll ignore the Marshall and VT items). It was difficult to pick favorites here, but I love the ruffle hoodie and baseball t.
2. VS Pink – I’m getting a little old for this line. Not a lot of the stuff appeals to me this year, but this hat is super cute! 3. Meesh and Mia - Cute, sparkly, but please stay away from the shirt with cut out arms. Of course I adore the ruffle top. 4. Pennington and Bailes – super.preppy.pants. I kinda need these, but I feel VS is too young, these may be too old. Maybe the hubs will get the matching men’s version #familypicturetime! 5. Things I wish came in my size. This,This and This. Maybe I just need to sew my own! · Haute Threads – this designer makes a customized dress out of the college t-shirt of your choice! · Ketch The Spirit – has cute dresses, BUT they NEED to add WVU! 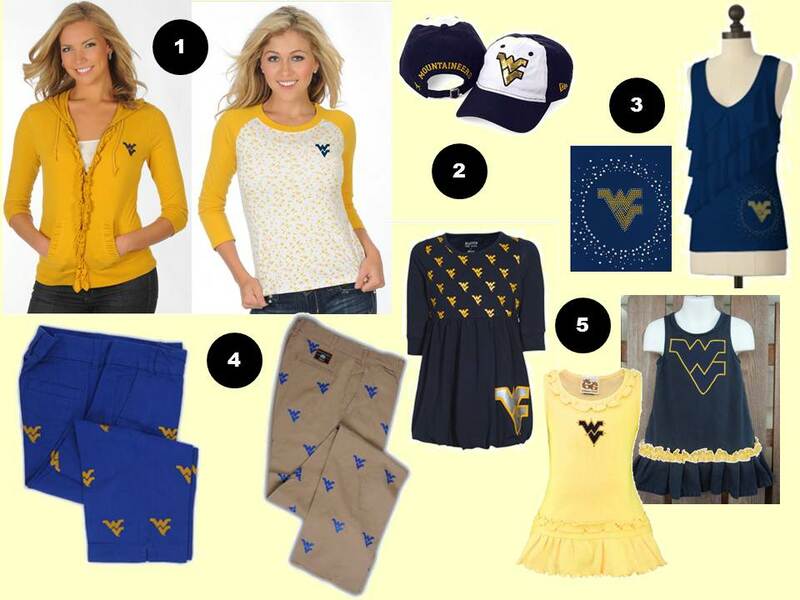 · American Eagle – has college apparel (I got a WVU hat last Christmas), but NO WVU stuff this year. Too many Pitt grads working at the headquarters! · Studs N Stuff – Obviously I own something from this site. She will customize a shirt for you with some sparkle!